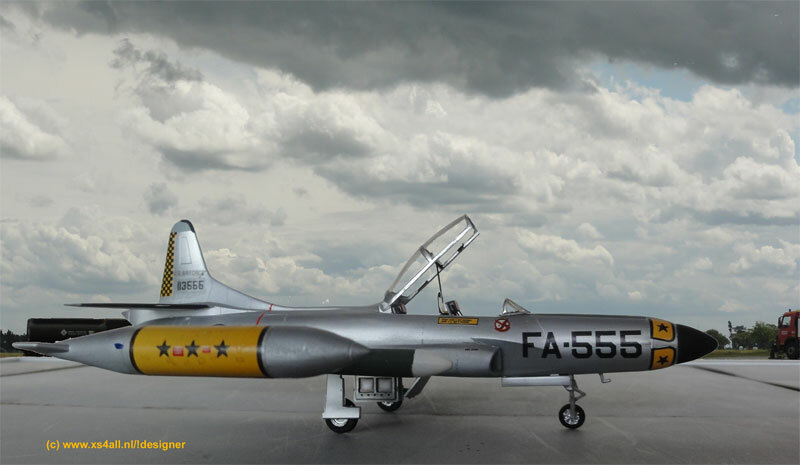 The Lockheed F-94 Starfire was first flown in 1949 as the USAF was in need of an interceptor. It was based on the first experiences of the F-80 shooting star flown a few years earlier. It was the first American USAF operational jet all-weather interceptor. 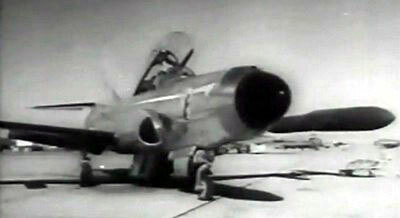 The Starfire was the first U.S. production jet to have an afterburner. It was equipped with radar in the nose to permit the observer in the rear seat to locate an enemy aircraft at night or in poor weather. 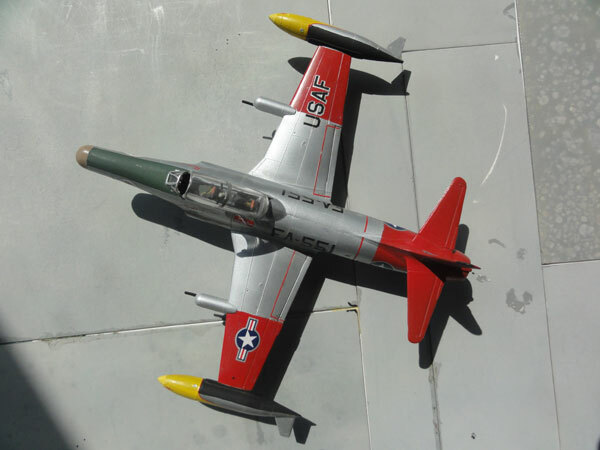 The first F-94 versions had guns, set in wing pods. On the F-94C the guns were removed. It also got a thinner wing and swept stabilizers as well as an all rocket armament. These rockets were fired from an altered nose and later also in pods on the wing leading edges. The type was not very reliable. 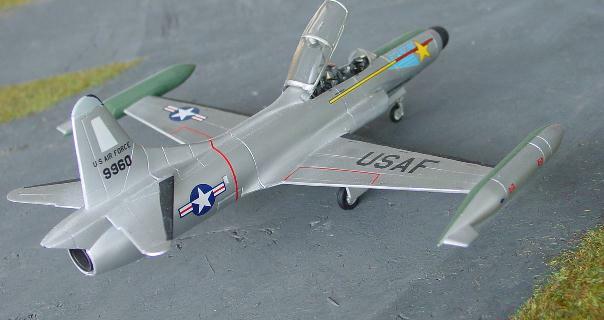 F-94's were primarily deployed for the defense of the United States in the early 1950s, serving with Air Defense Command squadrons. Later versions got pods on the wing leading edges. Lockheed produced 853 F-94's for the Air Force, beginning in December 1949. Maintenance was difficult and the type flew until 1959 with the USAF, being replaced mostly by the F-102 Delta Dagger. 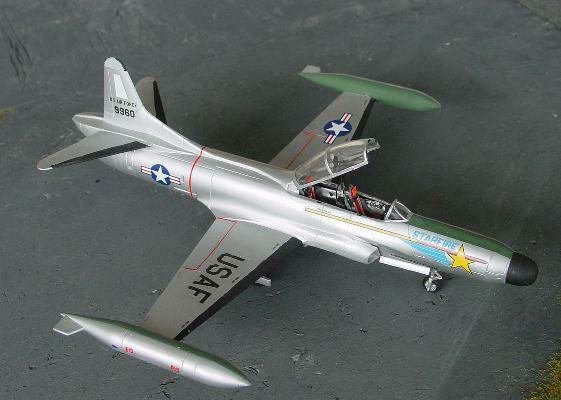 Many Air National Guard units were later equipped with F-94's but did not use the type for very long. 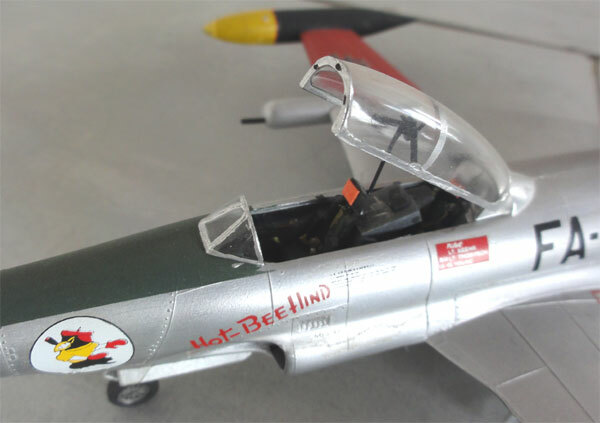 For the first model for a Lockheed F-94B Heller of France has issued an excellent 1/72 kit. It was made straight out of the box. Most work was adding the paint scheme with aluminium look and large red panels. The model was made many years ago, I remember airbrushing it in an old Humbrol "Silver colour". 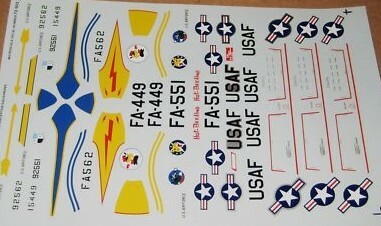 Decals for a "hot behind" F-94B were set on the model, they came from Microscale/Superscale Decals sheet no. 72-503. The yellow areas on the tip tanks had to be painted as well as decals do not cover it all. Note the old style early F-94 nose with brown "radar" nose. 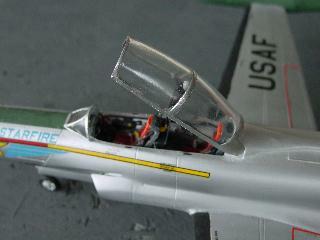 Some details were added in the cockpit with bit and pieces of plastic and tape. Note the red head rests. Two F-94C models were made, using the Emhar kit in 1/72. Here the "early style" kit #3003 was made. The kit's decals and the kit itself are a bit rough in areas. The moulding is not that crisp, canopy a bit thick and about 60 parts are in this kit. It has the correct characteristics of the -C like the swept stabilizer and different nose shape. However, when detailed and carefully assembled and sanded, it will result in a nice representation. 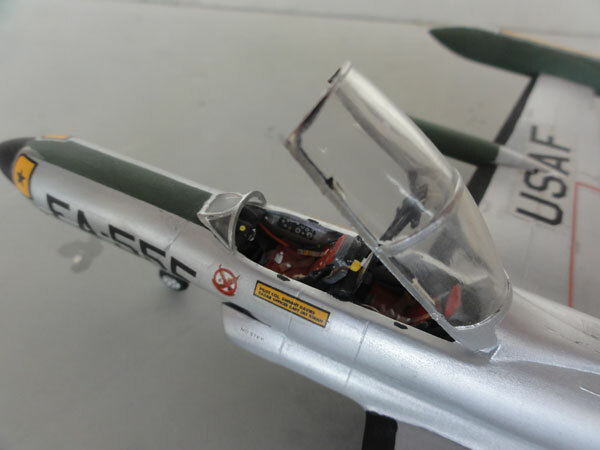 Two models were made straight out of the box a long time ago and simply airbrush aluminium using Humbrol "silver". 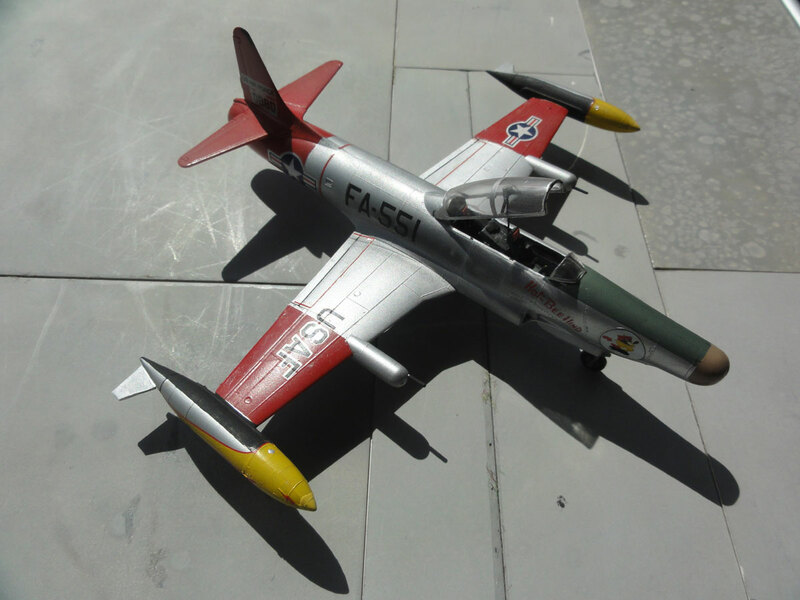 First an early F-94C with the Lockheed logo on the nose. 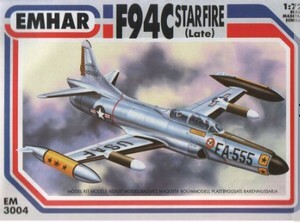 Another EMHAR kit was made, again for a F-94C Starfire but with a "later style" kit #3004 , a version with besides the nose rockets, additional wing leading edge rocket pods. These pod' noses were ejected before firing these rockets. and this is the kit... (You can note that the paint is too dull on the model. When building it now, I would recommend the ALCLAD II metal system ). Inside the cockpit some details can be seen, using strip, sprue and tape. Nothing fancy. 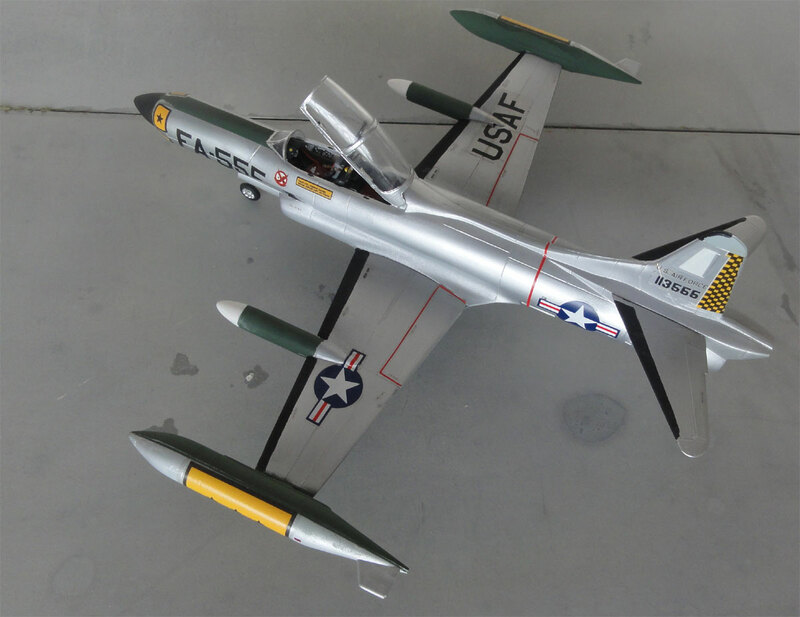 A bunch of nice Cold War models in the USAF collection.